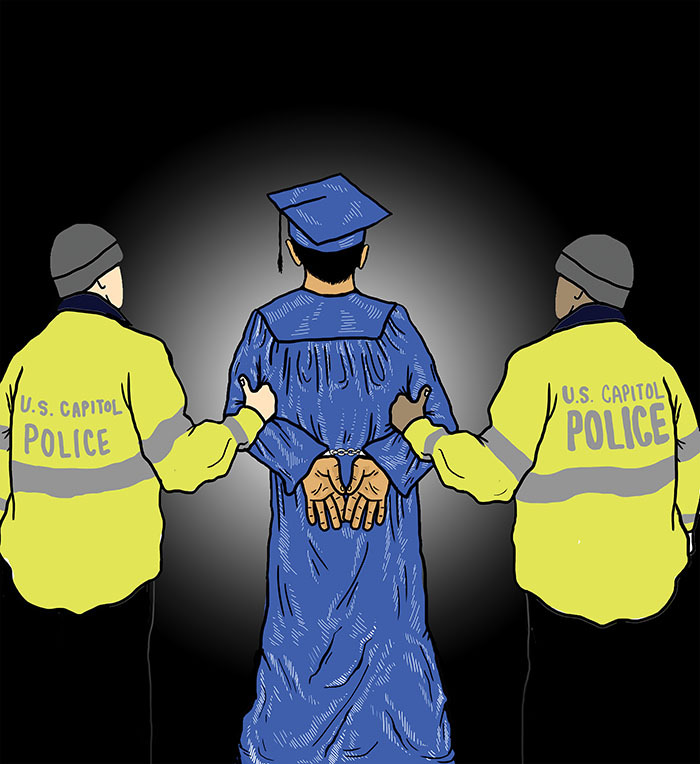 Ten protesters, dressed in caps and gowns, were arrested in Washington D.C. on March 27 after a demonstration demanding the rejection of what they deemed “The Raid on Student Aid” — up to $150 billion in cuts to federal financial aid programs such as the Pell Grant, Subsidized Direct Loan Program, Public Service Loan Forgiveness and income-based repayment programs. The demonstration was organized by the United States Student Association (USSA), which calls itself the largest and oldest student-led organization in the U.S., representing over 1.5 million student members. Over 100 students were involved in the protest, all of whom were participating in the National Grassroots Legislative Convention, an annual convention where students learn about lobbying and organizing on campus. House Republicans presented a budget proposal earlier this month that would freeze Pell Grant maximum annual awards for the next 10 years at the current $5,775, rolling back an expansion of student assistance proposed by President Barack Obama. Obama’s proposal included a $30 billion expansion over 10 years of the Pell Grant program and for the maximum award to continue to be tied to inflation. The cuts are a part of a larger attempt to cut federal spending and balance the budget. USSA President Maxwell Love said in an email statement that the action was successful, but the students don’t necessarily feel heard by their elected representatives. He said USSA sent 20 students to meet with Senate Majority Leader Mitch McConnell, but were denied a meeting. 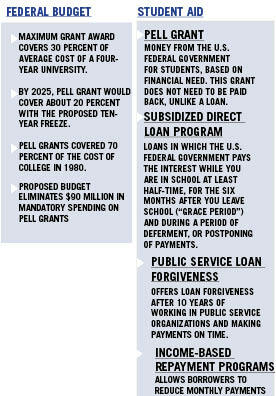 The proposal also changes funding for Pell Grants which would extract money from a discretionary fund, rather than a permanent mandatory fund, leaving it vulnerable to future cuts. UC Santa Cruz Student Union Assembly (SUA) Chair of External Affairs Louise Cabansay was one of the students arrested. None of the students arrested were charged, Cabansay said. She said the students paid a $50 fine to be released, but will still have an arrest on their record. Cabansay said the students were denied meetings with at least five California state representatives regarding issues in higher education. When asked if she felt students had allies on Capitol Hill, she said party politics limit how people’s interests are represented. Cabansay said UCSC only had four representatives at the conference, one of the smallest among all of the UCs. Budget cuts last year within SUA cut funding from the conference that historically takes about 15 students. USSA’s petition on MoveOn.org, which calls for a stop to the proposed cuts, has 13,603 signatures as of Monday night. In a public statement, José Luis Santos, vice president for higher education policy and practice at The Education Trust, said the House budget shows that college accessibility and affordability for low-income students isn’t a priority. In the 2013-14 school year, 9 million students received aid through the Pell program. Almost two-thirds of African American college students and over half of Latina/o students receive Pell Grants currently, according to The Education Trust. Forty-five percent of fall 2013 undergraduates at UCSC received Pell Grants. To afford attending UCSC, first-year Andrew Austin is fully dependent on the Pell Grant, Cal Grant and scholarships. Without the aid, Austin was unsure how he could continue to afford school. Austin said he might have to get two jobs over the summer if aid is cut. He said two of his housemates are in the same position.